When you wish to update your fireplace, there are many options that you could choose from. Your choice will depend on how much you wish to change your current layout in order to more effectively remodel your fireplace. You may wish to completely remodel your fireplace with a new mantel. There are many styles to choose from, including modern, rustic, and French country styles. You can also choose from a variety of color options, textures, and other features to make the mantel fit in with the style of your room or to stand out and become the focal point. 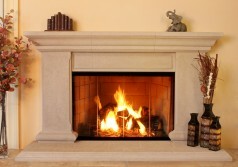 If you are going to replace your mantel, make sure your hearth is up to code and will last. The hearth is the protective layer that is inside of the fireplace and must extend a certain distance into the room for safety. If your hearth is not up to code or in excellent condition, you should also replace the hearth when you are replacing the mantel. For added elegance, you may wish to consider an overmantel, which extends from the mantel to the ceiling. For less permanent remodeling, you may decorate your fireplace, changing for the seasons. If you need assistance with your fireplace remodel in Orange County, the skilled associates at SoCal Fireplace Mantels are ready to help you to decide on the right style and features. You can even speak with a design expert to develop a custom fireplace mantel if you cannot find one to suit your needs.